MACROPEDIUS (1487-1558). Medieval Playwright is very much alive again! Medieval Playwright is very much alive again! After two minutes You will hear a song, composed by Macropedius, some 450 years ago. Joris van Lanckvelt, better known under his humanist name Georgius Macropedius, was born in 1487 in Gemert, a small town in the southern part of the Netherlands. He was a schoolmaster at the grammar schools of 's-Hertogenbosch and Liège and became headmaster in Utrecht. Macropedius wrote several Latin textbooks and became a famous Neo-Latin playwright. His schoolbooks were used in many cities in the Netherlands and beyond. His plays were performed not only in the Netherlands and many parts of Germany but also in England, Switzerland, Bohemia, Denmark and Sweden. Macropedius died in 1558 in 's-Hertogenbosch. His fame paled in the 17th and 18th centuries. Nowadays scholars in Western Europe as well as in North America study his works again. Little is known about the youth of Joris van Lanckvelt in Gemert (North Brabant, the Netherlands). He was born in the year 1487, possibly on the 23rd of april (St. George's day). His family belonged to the bourgeoisie. His parents were Willem Jansz. and Hadewich van Lanckvelt. Joris owed his family name to his mother, whose grandfather was related to the wealthy and aristocratic branch of the Van Lanckvelt family. After having visited the parish school and possibly having taken classes in Latin, Joris van Lanckvelt left Gemert and moved to the regional capital of 's-Hertogenbosch. Here he attended the local grammar school. It was the very same school where his famous older contemporary Erasmus of Rotterdam some twenty years before had spent two years. In 1502, at the age of fifteen Joris van Lanckvelt became a member of the Brothers of the Common Life in 's-Hertogenbosch. For the rest of his life he would be known as 'Frater Georgius' or 'Brother George'. He now lived in one of the houses of the Brotherhood and prepared for a career in teaching. About ten years later he became a priest and started teaching Latin at the municipal grammar school of 's-Hertogenbosch, the very same town in which at that time Jheronimus Bosch was painting his strange and marvellous pictures. About the age of twenty Brother George already had started writing Latin plays. The first drafts of his drama Asotus date from these years in 's-Hertogenbosch. At the same time he started writing textbooks for the use of his Latin classes. In 1523 Brother George lived in the House of the Rich Scholars at 's-Hertogenbosch. In 1525 Brother George was sent to Liège in the southern part of the Netherlands (now Belgium). Here he became headmaster of St. Jerome's. About thirty years before this school had been founded by the House of the Brothers of the Common Life of 's-Hertogenbosch. He then probably translated his Dutch name Joris van Lanckvelt into the partly Greek partly Latin Georgius Macropedius, as was the custom among 16th century humanists Georgius for 'Joris' and Macropedius for 'Van Lanckvelt' (the Greek makros for 'lang' or 'long' and pedion for 'veld' or 'field'). As in 's-Hertogenbosch there were seven formes in Liège. An eighth form was added to the curriculum however. In this form children were taught reading, writing and the Latin declensions. In the seventh and sixth forms the real learning of Latin began. In the fifth and fourth Greek was added. In the third form rhetoric was added to the curriculum and in the second mathematics. In the first form, the prima, the students studied theology as well. In 1530 Macropedius returned to 's-Hertogenbosch. Here his first textbook, a Latin grammar was published. The next year saw him back again in his native village of Gemert. His mother Hadewich van Lanckvelt had died shortly before and her will had to be executed. By the end of 1531 Macropedius moved to Utrecht, at the time the biggest city in the northern part of the Netherlands. 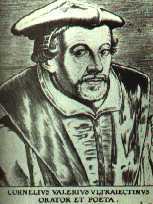 In Liège Macropedius had seen the rise of the Reformation. There he witnessed the burning of a priest who had shown leanings towards Protestantism in 1528. At the same time in Utrecht some schoolmasters at the grammar school who sympathized with the Reformation, were dismissed. According to the city council the school needed a reorganization. Macropedius, who apparently enjoyed some fame at the time and was reputed to be a loyal Roman Catholic, was appointed headmaster. In those days St. Jerome's in Utrecht was the most famous school in the northern part of the Netherlands. Here Macropedius taught Latin, Greek, mathematics, rhetoric, music and possibly Hebrew, too. He even built organs and every year he composed both the text and music of a lengthly Latin schoolsong. He also wrote various Latin textbooks which were published not only in Utrecht, but also in 's-Hertogenbosch, Antwerp, Paris, Cologne and Basel. His most famous textbook was the Epistolica, a book about writing letters and the art of logic and rhetoric. The book was first published in 1543 in Antwerp. Later on ten different editions were published in the Netherlands. In Germany independent editions were published in Dillingen, Basel, Cologne and Frankfurt. Moreover, between 1580 and 1649 the book was published six times in London. Epistolica seems to have been used at many schools in Western Europe. Macropedius owes his greatest fame, however, to his twelve plays. Aluta, Andrisca and Bassarus are farcial folk comedies. Rebelles (The rebellious pupils) and Petriscus are comedies about school life. Rebelles was printed, translated and performed several times in the western and southern parts of Germany. The performances in cities such as Neu-ötting in Bavaria (1556, 1557) and Eger in Bohemia (now: the Czech city of Cheb) (1561) have been well established. The remaining plays of Macropedius are serious plays. They are Biblical dramas: Lazarus Mendicus (Lazarus the beggar ), Josephus (Joseph in Egypt), Adamus (Mankind since Adam), Jesus Scholasticus (The pupil Jesus), Hypomone (an allegory about patience) and Asotus. The latter play is about the Biblical theme of The Prodigal Son. 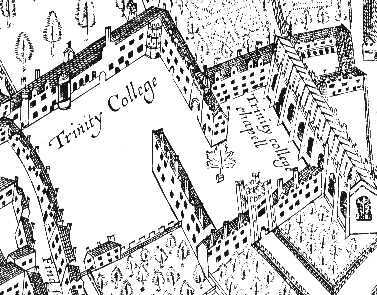 In 1565 it was performed by the students of Trinity College in Cambridge and one year later at the university of Prague. In 1539 Macropedius' most successful play Hecastus was published. This drama assured its author a place among the world's dramatists. It is a freely composed version of the late medieval Dutch morality play Elckerlyc (Everyman). The main character, Hecastus, is a wealthy young man enjoying the good things of life. When he learns that he has to die, not one of his friends, relatives or servants is willing to accompany him on his final journey. Hecastus was performed and printed both in the original Latin and in translation. Independent editions and printed translations are known from Cologne, Antwerp, Basel, Dortmund, Utrecht, Frankfurt, and Strassbourg. The play was translated several times into German. One of those translations was made by the famous poet of the Reformation, Hans Sachs. The play was also translated into Danish and into Swedish. In the Netherlands Hecastus was performed in Utrecht (1538 and 1539) and in 's-Hertogenbosch (1557). In Germany in particular the play was most successful. It has been established that the play was performed in Nuremberg, Königsberg (today's Russian Kaliningrad), Annaberg, Prague, Danzig (today's Polish Gdansk), Nördlingen, Trautenau, Frankenstein, Schmalkalden, Munich, Dresden, Basel and Soloturn (Switzerland). Through Hecastus Macropedius' fame spread all over the European stage in the 16th century and in the first part of the 17th century. Several times Macropedius was offered important positions. He declined all of them and wanted to remain the modest man he was. In 1548 he wished to resign as headmaster of St. Jerome's in Utrecht in order to devote himself to his literary activities. The Order of the Brothers of the Common Life, however, did not permit him to do so. 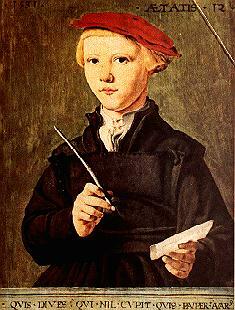 He was obliged to go on leading the Utrecht grammar school. That is why several of his plays were written in the evenings and at night. 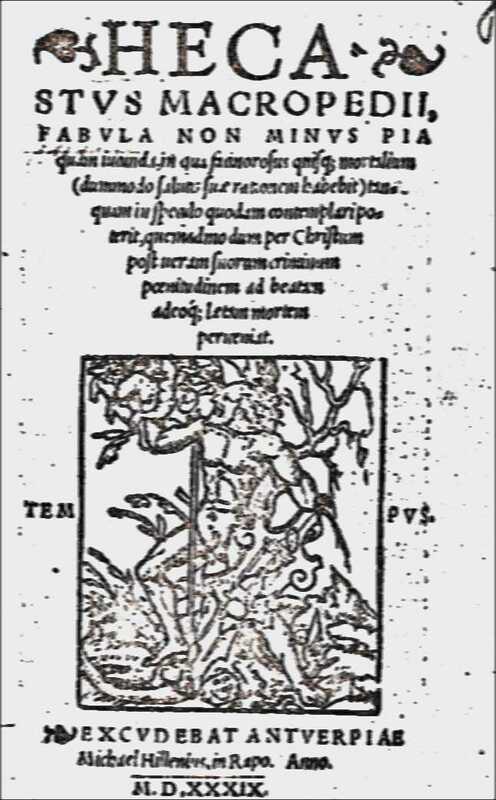 In the years 1552-1554 his collected works were edited in two volumes in Utrecht: Omnes Georgii Macropedii Fabulae Comicae. In those days the Roman Catholic Inquisition had gained influence in the Netherlands and Macropedius was obliged to rewrite various parts of his play Adamus before it was allowed to be printed. Even his masterpiece Hecastus had to undergo a revision. 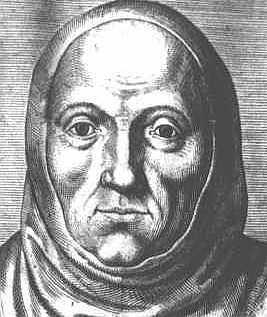 The tolerant humanist Macropedius was suspected of sympathizing with the Reformation. One year after he resigned his post as headmaster of St. Jerome's, and in 1556 Macropedius said farewell to Utrecht in order to return to his native soil, Brabant. Here he lived for another two years in the House of the Brothers of the Common Life in 's-Hertogenbosch. He died in this town during a period of the plague in July 1558 and he was buried in the Brothers' church. After his death his grateful former students erected a monumental tomb there, with an epitaph. They had a portrait of their beloved master painted, which was hung over the tomb. Both tomb and painting have disappeared. In the 19th century a canal had to be dug on the site of this church in 's-Hertogenbosch. Seven years after his burial, in 1565, a number of former students published a collection of poems on Macropedius in the then economic and cultural capital of the Netherlands, Antwerp: Apotheosis D. Georgii Macropedii. Later an article on Macropedius was published in a Swiss biographical dictionary of famous Germans. In 1572 his portrait appeared in an Antwerp book about Renaissance celebrities. During the 17th century, the golden age of Protestant Holland, Macropedius and his works sank into oblivition. The Brabant humanist had been loyal to the Roman Catholic church while the new protestant nation was not very much interested in Roman Catholic humanists. Moreover, his plays were written in Latin whereas the poets and playwrights of the Dutch Republic made increasing use of their native language. By the end of the 19th century he was rediscovered by scholars in Germany and the Netherlands. Since then countless books and articles about Macropedius and his works have been published. In 1972 in New York a book on Macropedius was published in Twayne's World Authors series. Two years later students of the municipal grammar school of 's-Hertogenbosch performed a Dutch version of his play Bassarus. On the occasion of the opening of 'Macropedius College' (a Comprehensive School) in 1975, the same play was performed in Gemert, his native town. A couple of his plays have been performed in several Dutch towns.since. Moreover, a number of his plays have been translated into Dutch, German and English. In 1996 the English translation of two of Macropedius' plays were presented on the Word Wide Web. It seems as if the old Dutch master is very much alive again. 's-Hertogenbosch, 1530, 1535; Paris 1554, Antwerp 1571. 's-Hertogenbosch 1538, 1551; Utrecht 1543. 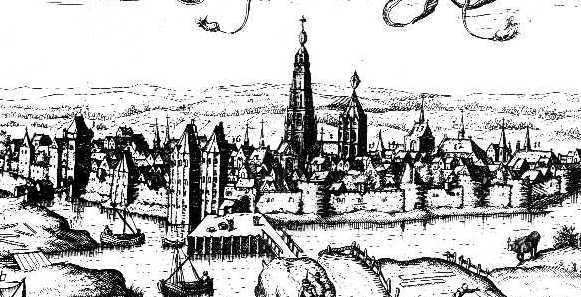 Utrecht 1541, Antwerpen 1550, Cologne 1562. Utrecht 1541, 1554, 1574, Basel 1591. Antwerp 1543, 1546, 1550, 1551, 1556, 1559, 1570, 's-Hertogenbosch 1556, Leiden 1564. Dillingen 1561, 1567, 1574, Basel 1565, Cologne 1568, 1570, 1582, Frankfurt am Main 1568, Antwerp 1573, London 1580, 1592, 1595, 1614, 1637, 1649. Do You want to participate in our research ? Please contact dr. Henk Giebels at Commanderij College in Gemert. Letter from Macropedius to his former pupil, Professor Cornelius Valerius in Louvain; Utrecht the 19th of May 1549. I have already received two letters from You, my most learned Cornelius, in which You very explicitly showed great affection for me. I can , however, only with great pains write one answer to You, because of the heavy discomfort and torture of the gout in foot and hand. First of all I am glad that Your business is doing a little bit better, and a higher profit will conpensate what went wrong in the Gallias. As far as our school is concerned, in short the following: The number of pupils is high, higher than ever before. The teachers are devoted, and diligently busy teaching their pupils. Bacchaeus went to Italy; I doubt if this is wise; but through an unlucky coincidence no one has been appointed in his place yet. Two men, most learned indeed, one after another offered their services before Easter; and as we were expecting them to come on the appointed day, neither of them turned up; they probably could get a better job. Therefore with all the needed delicacy we are obliged to turn to the ones who of their own accord offered themselves before and were not accepted then because others were engaged. Our mutual friends are doing well and they beg to be remembered to You. I myself, however, am tormented by the heavy discomfort of my gout in such a way that I am neither able to stand nor go unless leaning on a stick. If we are allowed to have faith in doctors, this critical year of my life does not promise very much good to me. May the will of the Lord be done! Nannius is so very busy with paying visits to others that he cannot find the time to tell me the things that have happened in Brussels. My Muses are languishing together with me: They are infertile now and do not produce anything good anymore; before Easter they would have given birth to something if it had not been for my bully, the gout, to prevent such a confinement. I send You my kindest regards, most learned gentleman. Your Macropedius, now "with swollen feet"
To the most learned gentleman M. Cornelius Veteraquarius otherwise called of Utrecht, an outstanding friend in Louvain at the house of the most learned Lambertus Verharius.